for such a historic and attractive pub it is a shame that the bar staff were unfriendly, served customers at random and never smiled (not even at each other) all the time we were there. This pub is always busy. The staff can be exceptionally obnoxious. Now, to address the above points, the fact that it's so busy suggests that it's actually a good pub. 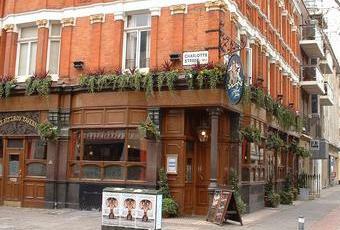 It is; good beer selection and interesting lively atmosphere always. random conversations can be had as well as private ones and the punters range from students to the west end workers to well off Fitzrovians to tourists. Its a Sam Smiths Pub. if you don't know what that means , google it. If you do, it's worth knowing that this is one of the most expensive SS pubs there is - weissbeir £3.50/pint, bottles much more. The staff can be rude. however, the surly glass collectress who thumped glasses and collected unfinished pints soon melted into a smily cherub when we engaged her in conversation and smiles. I am by no means saying that this should be necessary (it shouldn't), but London folk can be exceptionally rude and demanding as well and then cry when it comes back to them.. lighten up. and then go to the other SS pubs in the area if you want a seat and cheaper drinks!! Not as cheap as it used to be. Sam Smiths pub with its own unique brands that take a little getting used to. I was disappointed to see no handles here as well. That said, the pints of OBB I had were reasonably OK and the atmosphere fairly convivial.